These 5 Women Entrepreneurs In Pune Are Not Afraid To Dream - Queen Size! Home > Entrepreneurship > These 5 Women Entrepreneurs In Pune Are Not Afraid To Dream – Queen Size! These 5 Women Entrepreneurs In Pune Are Not Afraid To Dream – Queen Size! These women entrepreneurs in Pune all work in highly competitive industries, where they have had to prove their worth with creativity and sheer guts. Read on and be inspired! Pune is India’s largest education hub with renowned institutes like Symbiosis, Bharati Vidyapeeth, and Fergusson College. In the last two decades, an an efficient startup ecosystem has evolved in the city, with a rise in health tech, SAAS, automobile components etc. It has become home to many noted Indian companies as well as emerging startups. But sadly, most of these organisations that we hear about are founded by men. It is rare that we hear about female entrepreneurs who are making their mark in the world. So, we have assembled here a list of highly accomplished women entrepreneurs in Pune who are making a mark with their businesses. In 1997 when Sharmila Bhide came back to Pune from the US with her husband, outsourcing was in its initial stages and internet access was not easily available. This was the situation in which Sharmila Bhide along with her husband started Calsoft. Her 16-year old technology venture, which employs around 500 professionals, is a specialist in software product development services with niche expertise in storage, virtualization, cloud-computing, embedded, and networking. They started out with a capital of just Rs 4 lakhs and HP as their first client. There was no looking back from there. Sharmila is responsible for shaping all aspects of the company’s business strategies and spearheading financial planning and strategy initiatives. Prior to co-founding Calsoft, Sharmila was a Product Manager at Oracle where she led the design of the Oracle Receivables application. Sharmila feels that entrepreneurship gives one the opportunity to make their own mark and is especially great for women because they get the flexibility to balance their work along with their family life. At an age where individuals are still confused about what to do with their lives, Asa Ferreira, all of 25, is successfully running Socio Loca, her digital marketing company in Pune that celebrated its third anniversary this year. Asa says that it was the possibility of endless personal goals that made her start out as an entrepreneur. In its official website, Socio Loca is described as “an enterprise that came together with an idea to connect the real and the digital world”. Socio Loca has made a dent in a crowded market, with reputed clients. Asa feels that starting one’s own business is definitely a bigger challenge for a woman due to multiple social causes but then a healthy challenge is not always undesirable. A computer engineer, Ankita Shroff started SAV Chemicals Private Limited in Pune in 2014 when she was just 25 years old. The company manufactures Cyanoacrylate Adhesive (instant adhesive) Mxbon branded products for the consumer and industrial market, as a joint venture with Taiwan based Cartell Chemicals, an adhesive expert. Ankita’s desire to get international exposure and learn business got her a place at London Imperial College where she studied Management, after completing her graduation from Maharashtra Institute of Technology, Pune. That one year in London helped shape her dreams and on returning to India she started working first in her father’s business, before entering the chemicals business, one in which women founders are a rarity. The first year was difficult for her as Ankita was not at all familiar with the business aspects. It was a learning experience, however. Being inexperienced and young, it was her consistency, patience and support that helped Ankita’s dream take flight. Ankita plans to expand into hardware and stationary sector next in Rajasthan, Gujarat and Maharashtra in the coming years. Trained at the renowned California Culinary Academy in San Francisco for 18 months, Meeta Makhecha spent more than four years there, gathering experience by working at elite establishments like Les Folie. She was also coached by famous chocolatier Michael Recchiuti. Returning to India with her husband, she worked as a food consultant for some time before starting out on her own in 2012 at 43 years of age with the Flour Works Café and Bakery in Pune. Word of mouth recommendations worked wonders for her and pulled customers towards her restaurant. Meeta slowly learned the ropes of the restaurant business and is quite happy with how far her venture has come. Flour Works today has expanded greatly with three outlets in Pune. Meeta is now working hard to expand her business even more and get 6-8 outlets in and around Pune. Founder and Chief Products officer at Jombay.com, an award winning Talent Measurement, and Analytics Company, Suruchi Wagh completed her Bachelor’s degree in Computer Science from College of Engineering Pune, before flying away to the US for her Masters. Jombay began life as a career counseling portal aimed at helping youngsters make an informed decision about their careers before Suruchi decided to broaden its scope. Jombay is now “on a mission to help companies reimagine HR” she says, “by building products that take a people first approach to fuelling performance”. Suruchi believes start-ups are all about surprises and uncertainties. And if successful, startups end up doing much more than what other companies pull off. Jombay today has offices in more than 4 countries and 500 clients in the kitty. These brilliant women entrepreneurs in Pune have defied the odds, making a space for themselves in competitive markets with their hard work and dedication. They have inspired many women across the country and I hope my article inspires you too! If you are a woman looking for more inspiration, note! 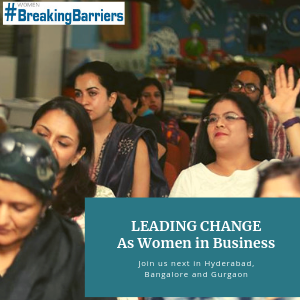 Breaking Barriers 2018, the flagship event for women in business, comes shortly to Pune, Panjim, Hyderabad, Kolkata and Coimbatore. 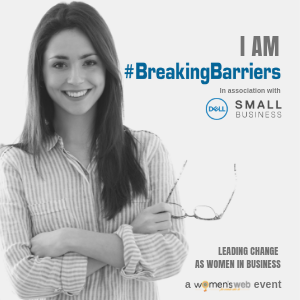 Register here to receive your free invitation! From Karwar To Pune And West Bengal to Chennai, Where Do I Belong?